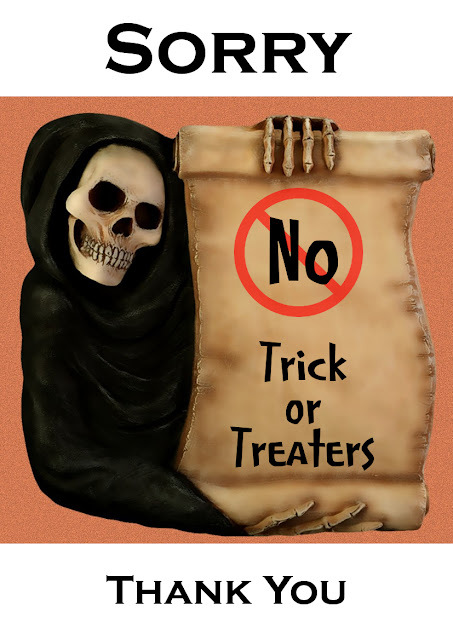 There are many reasons why you may not want trick or treaters to call this Halloween. It doesn't mean you're a humbug and hate this Fall season occasion. 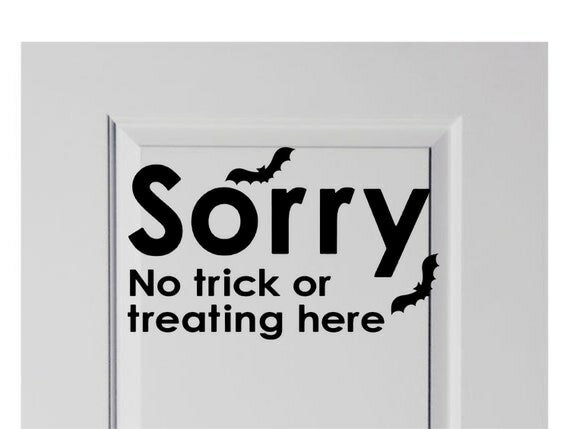 Whatever the reason, here are 2 free no trick or treat signs that are printable. All you need to do is save these free printables to your own device and print them off or take them to a print shop to be printed for you. Included is a grim reaper sign and a Fall season one. They will work for standard letter size, A4 paper or smaller. Perhaps you have a baby who you don't want to get woken up with the doorbell being rung over and over. You may want to put this up to help protect a vulnerable or elderly family member. Or you may just be away from home. The free printable posters below are saved as a standard .jpg photo file which makes it very easy for you to download and print. If you have a Windows computer, when you tap on the file it will probably open up in the photo gallery. From there you click on Print at the top. If it opens up via another program, there should be a print function somewhere. The photo above is what I get when I hit print. I can choose to print it as a full page photo on a standard sheet of paper. This will use more printer ink. If this is going to be a problem, you can opt to print a smaller version where you can add up to 2 copies on one page. This will give a half sheet print which is still a reasonable size to pop on the front door. The designs print fine on paper but will wrinkle up less if printed on to some card. So use card if you want the final print out to look better. You can laminate the design if it is raining or the weather is damp in order to protect it better. Nothing means business quite like the ghoul of death himself, the Grim Reaper. 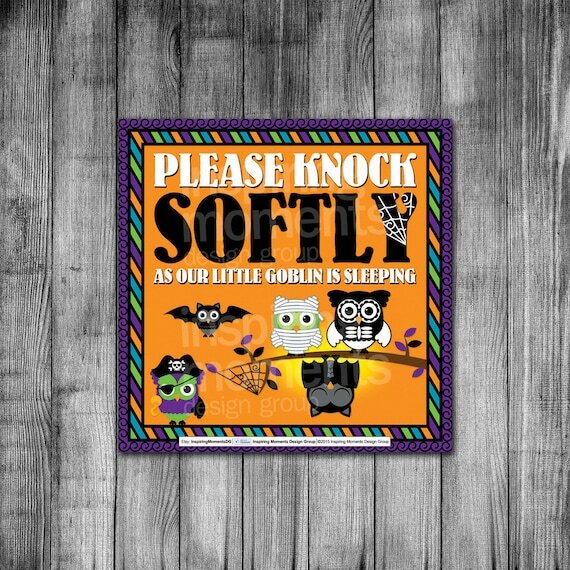 Let him frighten away any trick or treaters who dare to come near your door. For a more subtle look, how about this seasonal Fall design poster with the pumpkin and the Fall leaves as motifs. 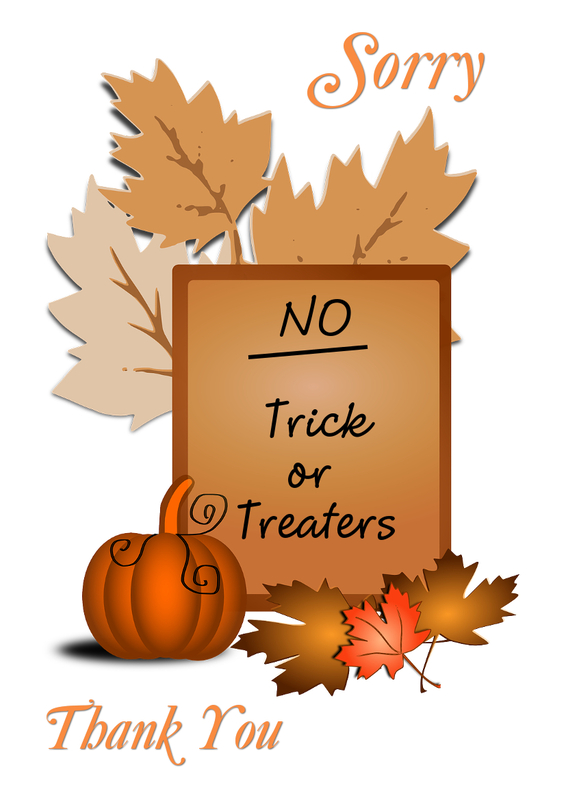 These free No Trick Treater printables are for your personal use only. You are welcome to share and also blog about how you've used these freebies along with your own photos providing that you include a link back to this page.